Forever thrifty in the kitchen, New Orleans cooks would never dream of wasting good, but stale French bread. 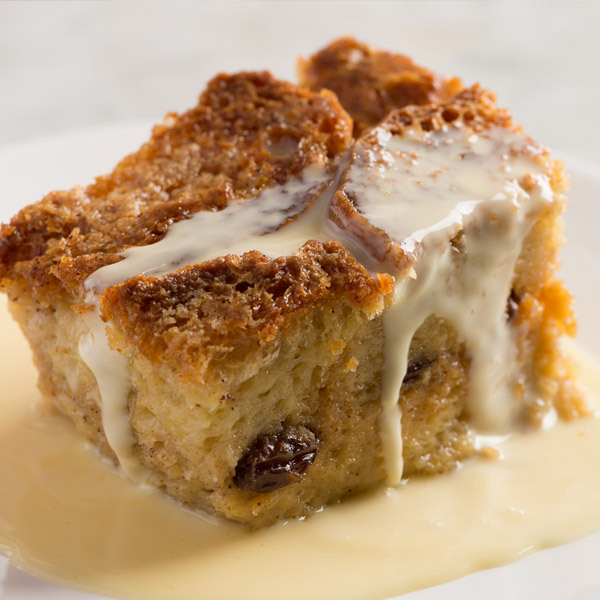 Over the years, bread pudding has become our city’s favorite dessert. It’s on every menu in town and every restaurant makes it differently. Some add chocolate, some dried fruit and nuts, some soufflé them. But ours is traditional and delicious. New Orleans bread is light and airy with a very tender crust that softens in this bread pudding. We could recommend other breads, but the bread pudding won’t be like the one we serve at Mr. B’s. Different breads absorb custard differently—your final result could be more custard-y or drier. Preheat an oven to 250 degrees. Make pudding: Arrange half of the bread in a 13- by 9- inch baking pan and sprinkle with raisins. Arrange the remaining half of bread over top. In a large bowl whisk together eggs, cream, 2 cups sugar, 1 tablespoon cinnamon, and nutmeg until smooth. Pour half of custard over bread and gently press down bread. Let sit until bread soaks up custard, about 15 minutes (depending on bread). Pour remaining half of custard over bread and gently press down bread. In a small bowl combine remaining 1/2 cup sugar and teaspoon cinnamon and sprinkle over bread. Dot bread with butter and bake 1 1/2 to 2 hours, or until custard is just set in the center. Make whisky sauce: In a medium saucepan bring cream and milk to a boil. In a medium bowl whisk together sugar and yolks until combined well and gradually whisk in hot milk mixture. Transfer mixture to a double boiler and cook over just simmering water, stirring gently but constantly with a rubber spatula or wooden spoon, until thick, about 12 minutes. Pour sauce through a fine sieve and stir in whiskey. Serve sauce warm or cold. If chilling sauce, let sauce become completely cold before covering, as condensation will cause it to thin. The sauce can be covered and chilled for up to 3 days. Makes 2 3/4 cups sauce. Serve pudding warm drizzled with whiskey sauce. Makes one 13 X 9 inch baking pan, serving 12.